Here are some songs to welcome children to a session. For children under 5 it’s great to build up a reassuring routine and songs are an important part of this process. Enjoy singing! Heuristic play is a method used in lots of nurseries and pre-schools to help children to explore, create and use their imaginations. For children in church it’s brilliant because it helps them to start thinking, questioning and exploring and well as inspiring some awe and wonder! As they are allowed to freely explore, it also helps the children to build their independence and creativity. Even the adults can’t resist having a go themselves! Heuristic play involves having collections of items (plenty of each to go round) which the children can then play with without adult intervention. Play can be themed if you are looking at a particular story. Use items such as: corks, kitchen roll tubes, boxes and tins, napkin rings and bangles (and mug trees to put them on! ), shells, pinecones, corks, pegs, stones, egg boxes, ribbons, muffin tins, bottle tops. Click here to see a Pinterest board of heuristic play ideas. Have fun watching imagination and creativity develop! 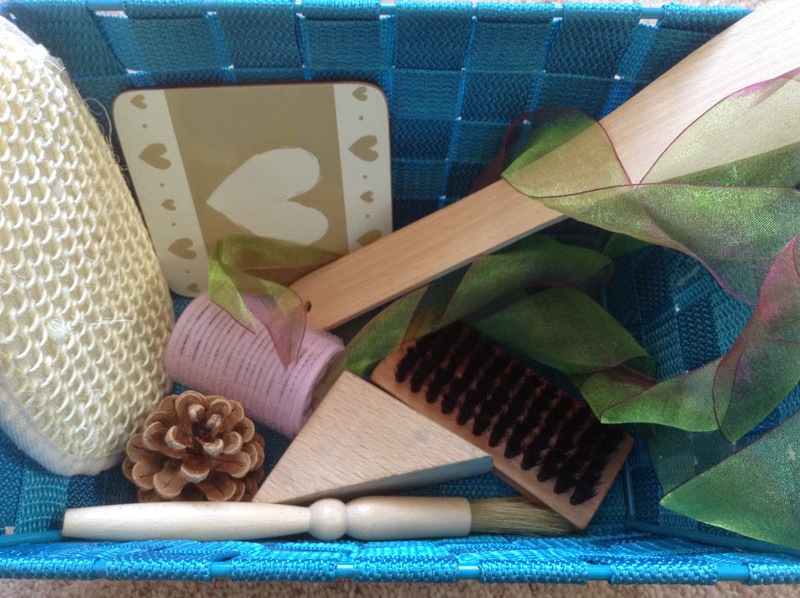 Treasure baskets are a great way for babies who can’t yet crawl to discover textures, sounds, shapes, smells and colours. They can reach into the basket and pull out anything that strikes their fancy, exploring everyday items with wonder! Click here to see a Pinterest Board of treasure baskets you can make yourself.